Author(s): Sabina Licholai, Wojciech Szczeklik, Marek Sanak. Division of Molecular Biology and Clinical Genetics, Department of Internal Medicine, Jagiellonian University Medical College, 8 Skawinska Street, 31-066 Krakow, Poland. Background: Abdominal aortic aneurysm (AAA) is usually asymptomatic and mostly diagnosed incidentally. Aortic dilatation progresses along with the wall weakening and eventually leads to a life-threatening rupture. Currently, there are no effective screening biomarkers for AAA. MicroRNAs, a class of small noncoding RNA molecules, offer great potential as biomarkers because of their stability in the bloodstream and expression profile specific for different diseases. 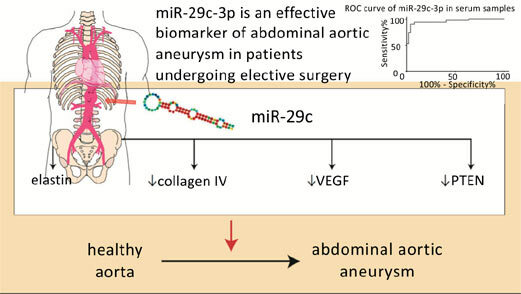 Objective: To assess the circulating miR-29c-3p as a potential biomarker of AAA and to elucidate the biological functions of miR-29c-3p in terms of pathogenesis of aneurysms. Methods: Two groups of patients scheduled for elective surgery were studied: 52 patients with AAA, and 51 patients with peripheral artery disease who served as a control group (matched by age and gender). Serum miRNA was measured for circulating miR-29c-3p using quantitative real-time PCR. Functional tests of miR-29c-3p impact on the targeted transcripts were studied using its mimic or inhibitor and a cell culture of endothelial cells. Results: Serum miR-29c-3p was significantly elevated in AAA patients as compared with controls (RQ=8.73) and correlated with the diameter of the aneurysm. No association between well-known risk factors and level of circulating miR-29c-3p was found using a logistic regression. In vitro study revealed that miR-29c-3p suppressed transcripts of ELN, COL4A1, PTEN and VEGFA. Conclusion: The results suggest that elevated miR-29c-3p is a potential serum biomarker for AAA. Causal involvement of miR-29c-3p in pathogenesis of the disease was found in human vascular endothelial cells, which extracellular matrix synthesis and integrity maintenance was inhibited. Keywords: Abdominal aortic aneurysm, endothelium epigenetics, microRNA biomarker, miR-29c-3p, non coding RNA, serum miRNA. Affiliation:Division of Molecular Biology and Clinical Genetics, Department of Internal Medicine, Jagiellonian University Medical College, 8 Skawinska Street, 31-066 Krakow, Poland. Keywords:Abdominal aortic aneurysm, endothelium epigenetics, microRNA biomarker, miR-29c-3p, non coding RNA, serum miRNA. Abstract:Background: Abdominal aortic aneurysm (AAA) is usually asymptomatic and mostly diagnosed incidentally. Aortic dilatation progresses along with the wall weakening and eventually leads to a life-threatening rupture. Currently, there are no effective screening biomarkers for AAA. MicroRNAs, a class of small noncoding RNA molecules, offer great potential as biomarkers because of their stability in the bloodstream and expression profile specific for different diseases. Abdominal Aortic Aneurysm (AAA): Is There a Role for the Prevention and Therapy Using Antioxidants? Should We be Concerned About the Inflammatory Response to Endovascular Procedures?